The contest carries a remarkable prize of a trip for two to Madrid (T & C’s apply) and the winner will be announced at the event. Second prize is a Trolley Dash at Park Lane Spar as well as two tickets to the next Flamenco Fusion evening and third prize is four tickets to the next Flamenco Fusion evening. Guests too could go home with one of the many lucky-draw prizes. With guitars and castanets filling the air with lively melodies, the cultural event on 12 October 2018 – to celebrate National Spain Day - will feature delectable delights and an opportunity for guests to enjoy a colourful Spanish experience. Alma Flamenca dancers, in vibrant costumes, will swirl and stamp to pulsating tunes from a local, South American band - and fire dancers will demonstrate their skills. In this lively space, amateur chefs are invited to don their aprons and display their abilities to produce a prize-winning paella. The traditional Spanish dish comprises mainly white rice and mixed seafoods. Originating from Valencia, paella has ancient roots. Its modern form, however, stems from the mid-19th century in the area around Albufera lagoon on the east coast of Spain adjacent to the city of Valencia. KwaZulu-Natal’s celebrity chef, Jackie Cameron, has invited other celebrity chefs to judge the entries and the winner will be rewarded with two airline tickets to Madrid, Spain by courtesy of Crossways Travel (Hilton). Jackie Cameron School of Food & Wine has often hosted cultural events - and Cameron, with local Spanish dance teacher, Cornelia Puler, has successfully co-hosted Spanish evenings at the school, in the past. “To host the Spanish festival with a cooking competition is very exciting,” says Cameron, clearly enthusiastic about this upcoming event. “I value seeing amateur chefs displaying their talents and enjoy the Mediterranean flavours from Spain. There are many creative home cooks out there and this is an opportunity for them to reveal their culinary skills. With the competition being based on a single, well-known dish – namely paella – contestants will have to make a meal that stands out from the other competitors’ entries. We will be looking for the traditional flavours of a paella and would also like to see that ‘something’ that sets the dish apart from the norm. Presentation of the finished dish will count, as will the techniques competitors adopt during the cooking process. The latter will demonstrate the contestants’ ease in a kitchen environment. This festival will be a celebration of dance, flavour and fun. It’s aimed at families and at enthusiastic amateur chefs. Guests will have the opportunity sample Spanish food, prepared by the students at Jackie Cameron School of Food & Wine - think spicy chorizo sausage and the sweet flavour of sangria – a Spanish ‘punch’. 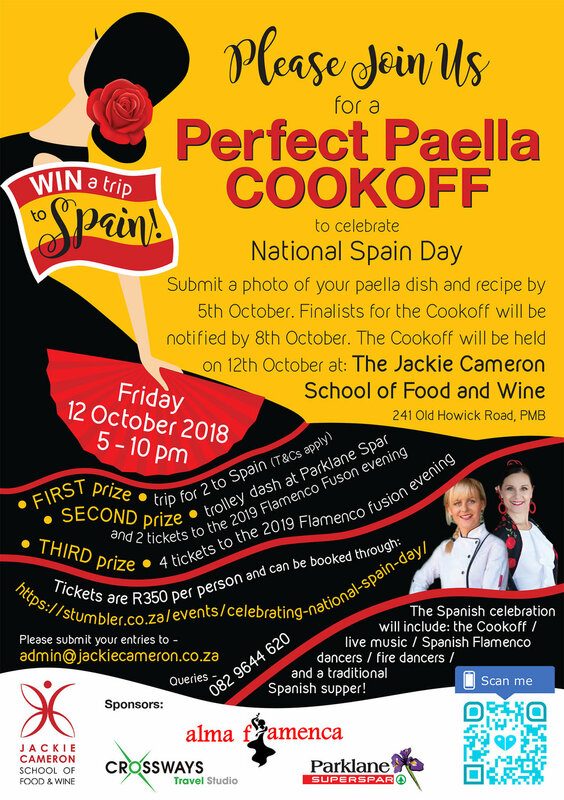 To enter the Perfect Paella Prize cooking competition, send an email to admin@jackiecameron.co.za with a picture of the final dish and the recipe. Closing date for competition is 5 October 2018. Finalists will notified by the 8th October 2018, for the Perfect Paella Cook-Off on the 12th October 2018, where the celebrity judges will decide the worthy recipient of the Perfect Paella Prize (T &C’s apply).